The Sheep Whisperer: The King of "Stick-to-it"-ness! "The act of persevering; continued, patient effort; persistence". Perseverance, as with any trait, is a direct result of the Holy Spirit's shaping of a person's character. 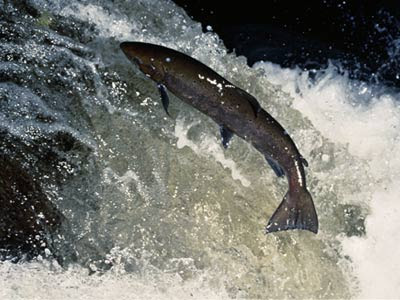 In the world of nature, we see this trait clearly on display in the King Salmon. 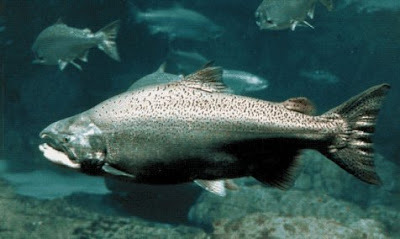 I'm not Elvis, but as the "King Salmon", I'm the state fish of Alaska! 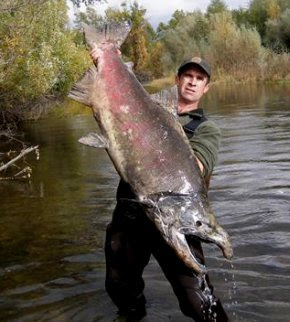 King Salmon are an ideal illustration of Perseverance. 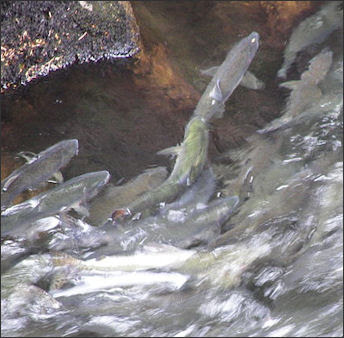 They will instinctively travel 2000 miles to reach their spawning grounds. They swim 25 miles a day after switching from ocean salt water to fresh water on their dangerous quest. 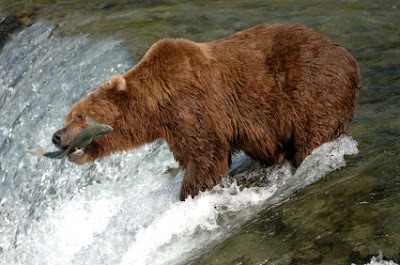 They persist in their trek, not stopping to eat while in fresh water, ensuring that they'll reach their final destination, where only the strongest survive! Are Ewe sure we can't stop for lunch? I'm Hungry! Have Ewe ever tried to jump 15 feet up the current of a waterfall? On their trek, there are numerous obstacles to overcome. First, they must swim against the current which requires more energy. Next, they must negotiate waterfalls, which at times, demand that they jump 15 feet high to advance. Finally, they must avoid bears, birds of prey, & fishermen, persevering to reach their final destination. Bear with me! I can't talk with food in my mouth! This King has been Dethroned! Upon arrival at the spawning ground, a territorial "male" mating rights battle ensues, resulting in: "to the victor, the spoils"! (Chance to mate) The females each lay 30,000 eggs, which develop in various stages ; embryo, fry; & parr; before starting their arduous journey back to the ocean. After caring for their young, the parents drift off & die, knowing that perseverance helped them to pass the torch on to the next generation. Only the "Strongest & Fittest" will survive this Trip! 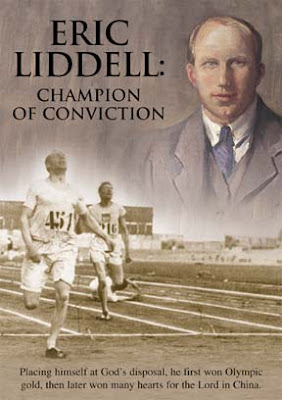 Eric Liddell is an individual who illustrates the character trait of Perseverance. 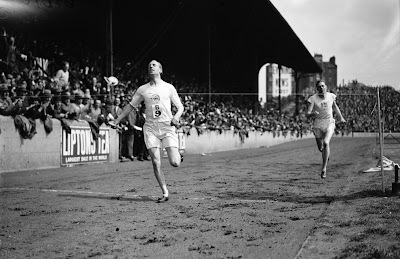 Eric returned to China a year after winning a Gold medal in the 400 m., & a Bronze in the 200 m. events in the 1924 Olympics. 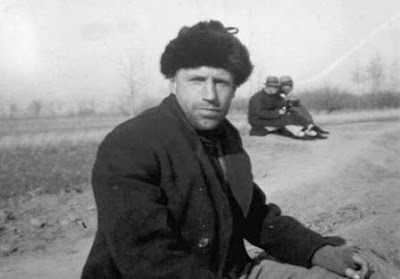 While he served as a missionary, he was married & had children, In 1943, prior to being imprisoned in a WW 11 Japanese internment camp , he sent his family to Canada for safety reasons. To God Be the Glory! He gives me the strength to run! While in the internment camp, Eric continued to persevere in this difficult situation. Separated from his family, he decided to serve others in the camp, rather than feel sorry for himself. He counseled, lead Bible studies, & taught lessons to the children. He touched many lives with the love of Jesus Christ. The Chinese government recently released documents confirming the story, that he allowed a pregnant woman to take his place in a prisoner exchange. Eric's health declined & he finished his final race on Feb.21,1945, dying of a brain tumor, but crossing life's finish line into a bright future! Eric in prison camp." Christ for the world, for the world needs Christ!" Perseverance Pays Off, in the Long Run! Ewe Know I Love spending time with Ewe! As Ewe reflect on the persistent Love of the Shepherd today, allow His peace to saturate Ewer life, knowing that Ewe aren't alone. Thanks Anonymous! Thanks for "Persevering in writing comments! God Bless EWE!